Fran Jurga`s Hoof Blog: News from Hoofcare + Lameness: Horseshoer Handicapping: Whose Workmanship Do You Like in the Derby? Horseshoer Handicapping: Whose Workmanship Do You Like in the Derby? Every year, I hear people tell me that they bet decent amounts of money on the Kentucky Derby because they like the sound of a horse's name, they remember the trainer won ten years ago, or they always bet the six horse. So why not bet the horseshoer? On the other hand, I know people who study the minutiae of horse equipment and notice if a jockey changed boots between races and wonder whether that will affect his ride. You know who you are. A quarter-crack story breaks in the Daily Racing Form and you suddenly remember why you have my number on speed dial....but forget that I don't keep racetrack hours. So this year I decided that the Derby was a pretty muddy field, probably in more ways than one. There are several horses who might be legitimate favorites and some we don't know much about, but they have names like Zito and people like high school principals attached to them. With the help of Dan Burke of Farrier Product Distribution who keeps track of things like this, we have made it possible for you to add to your Derby betting arsenal of information with heretofore unavailable data: the horseshoer's name, a sample of some of his stellar past winners (if I could find them), his migratory pattern, and what shoes the horse will (probably) be wearing. I stumbled at the last one except for what Dan could supply: The letters 4K after a horse mean that he is wearing four Kerckhaert raceplates. Most of the other horses are wearing at least two Kerckhaerts, some with toe clips, on the hind feet. Toe clips on hind feet is a relatively new style innovation on the racetrack. As the weather pattern changes over Kentucky, the shoes may also be changed, so don't hold me to the shoeing details. Some trainers are still making their minds up about whether to add bends or not. Horses not shod with the European Kerckhaert plates would be shod with American plates probably made by Victory or Thoro'Bred or a Euro-style plate made by St Croix. 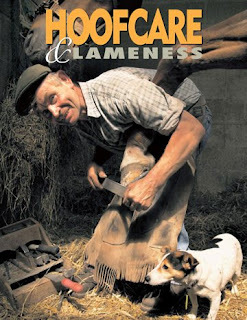 Shoers may sometimes mix American and Euro style shoes on the fronts and hinds, which was the case with Street Sense but they will almost always put shoes on in pairs unless they are treating a hoof problem and need to put a different sized shoe on, or cut part of a shoe off ("three-quartering"). That may be the case with Dunkirk today, who may have a wedge shoe on the fronts with Kerckhaerts behind. Don't be alarmed that Dunkirk is shod differently; that is standard for Ray Amato and it's certainly worked well. Just look at Pletcher's record and you won't argue with Ray's shoeing. In his career, Ray has shod for most of the Hall of Fame trainers...but, like Todd Pletcher, has never had his work actually cross the finish line first in the Derby. Maybe today will be the day. I'll update this during the day on Saturday as I compile more data. I am sure that all of these farriers have shod plenty of well-known stakes horses. They're all at the top of the game. If you see any mistakes, let me know! Thanks to Dan Burke for helping with this. Everyone watch for Dan's 1958 Chevrolet pickup truck on the backside during the telecast, either on ESPN or NBC; he has a custom Stonewell farrier rig built into the back and it will be put to good use when Pioneerof the Nile gets hot-seated. I can imagine that that will attract a few camera crews...and possibly a fire truck or two! It's not something you see at the racetrack anymore, but on a muddy day like today is shaping up to be, it's not a bad idea. Pioneerof the Nile may be from California and not know what mud is, but his shoer is from Boston, and he knows very well what mud is and will take care of his horse. Shoeing the TB race horses should be/is going to be looked at closely and scientifically. Individual farriers have very little info on what shoe styles and brands are effective in terms of speed and safety depending on hoof conformation, weather, and, per your Larry Jones photo, time when the horse should be shod pre-race in terms of safety, change of angles immediately pre-race, etc. And the question of different styles of shoes on fronts and hinds, per the toe grab fiasco that has been foisted on the sport by incomplete research. Are horses comfortable running in different styles front and hinds, does this effect stride, etc. The sort of info in your post helps toward understanding! Thank you, Mr Rapid, for "getting it". However, the information that I published is just the tip of the iceberg. For instance, Kerckhaert makes several styles/,models of shoes and some horses were even running in the Derby with the Synergy (Polytrack design) shoes on! For privacy reasons, I did not give those details but I think that someone somewhere should be paying attention to them. However I do not think anyone but me is taking notes.